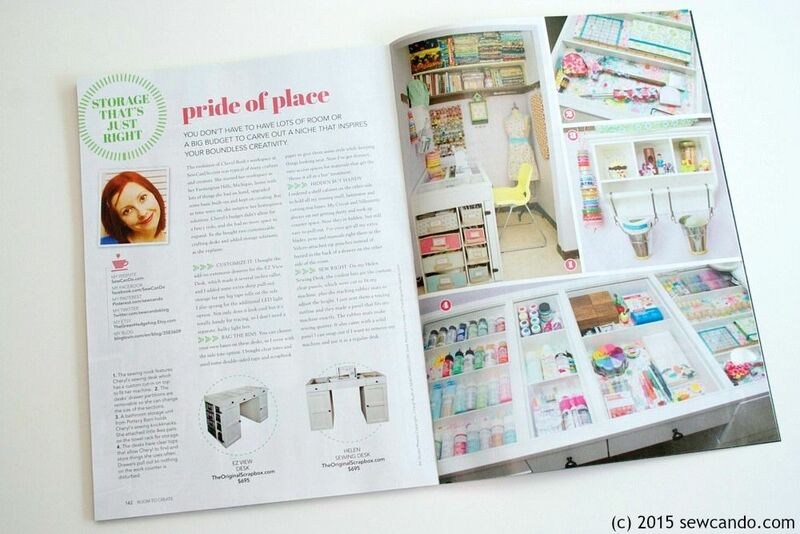 This week I'm making up for lost time by sewing as much as I can & getting creative instead of writing tutorials, but I do have something new to share...I'm in the premiere issue of Room To Create Magazine! This magazine is all about places to craft & create and shares the crafty spaces and studios of several designers, as well as some favorite craft bloggers. When I was originally approached about being featured I didn't know I'd be among such big names. I'm very honored to be included! My room has got a lovely spread that shares some great photos and how I've maximized my small space with strategic organizing. 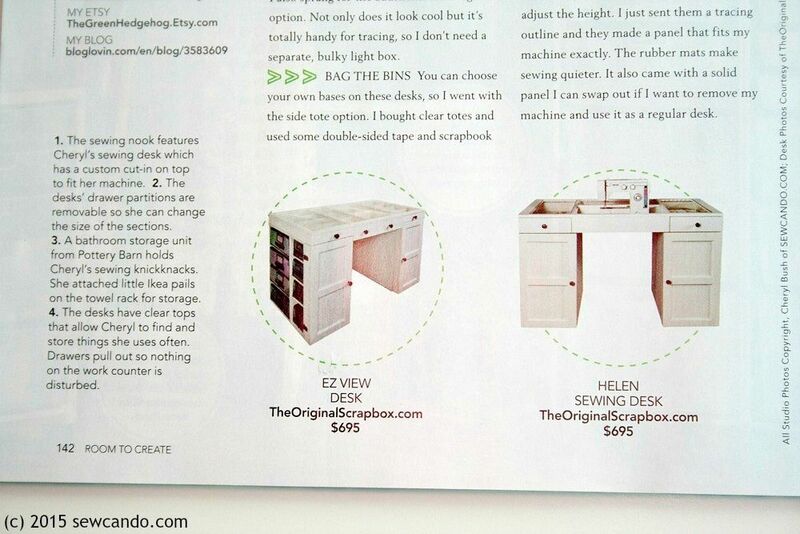 It also showcases the lovely EZ View and Helen Sewing desks I bought from The Original Scrapbox and then customized for a unique Sew Can Do look. I've had them for over a year now and things still look this neat and organized. I can't recommend them enough!! And if you think that a dream craft room is out of your budget's reach, requires more space than you have, or is only for serious craft bloggers, check out my post sharing how I got my Small Space Dream Craft Room to come true (it's easier than you think). 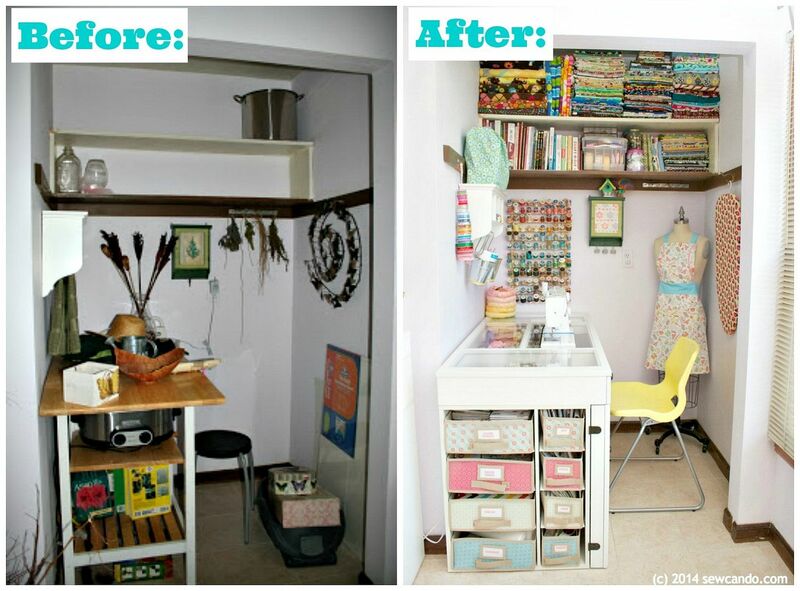 See how I started with my original $85 Craft Room post and follow-up Craft Room tour too. It may not happen overnight, but I'm proof that it can happen, no matter where you start! 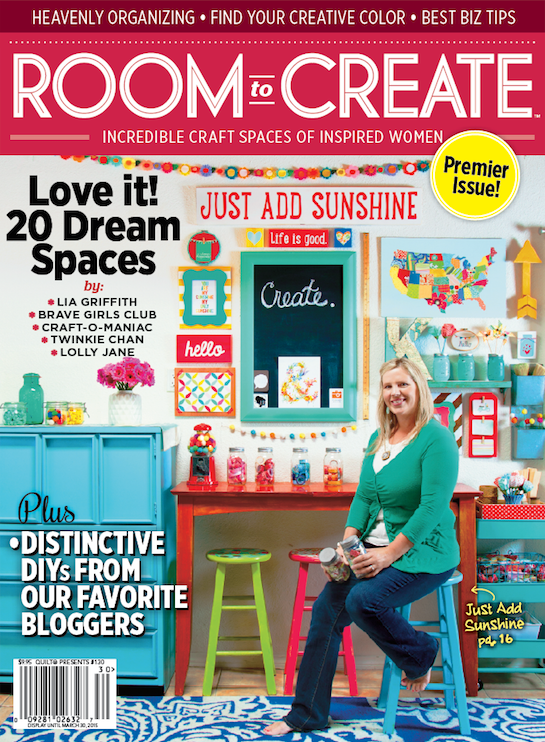 You can find this issue of Room To Create at Target, Barnes and Noble, Wal-Mart, Hobby Lobby and many grocery stores through the end of March. 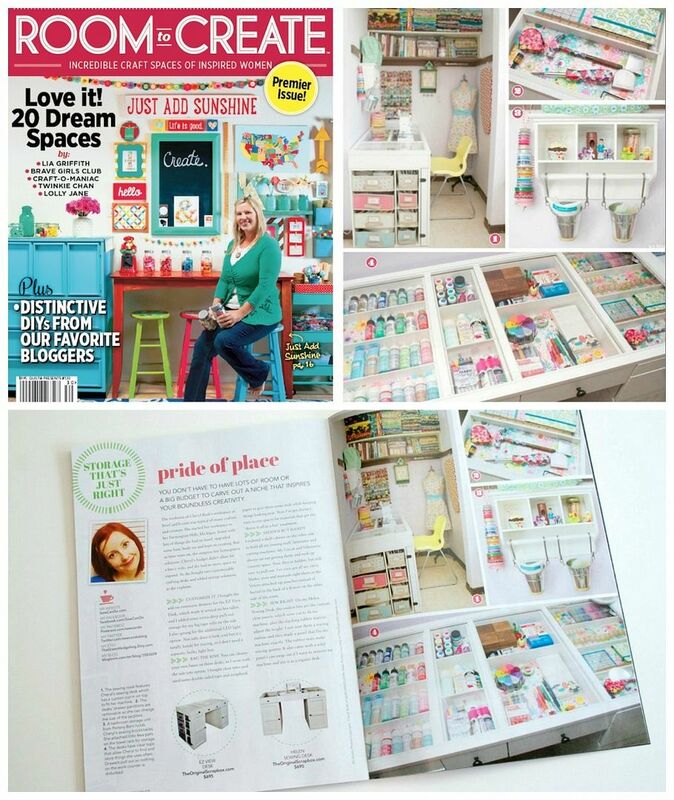 What a great craft room and congrats on the feature! 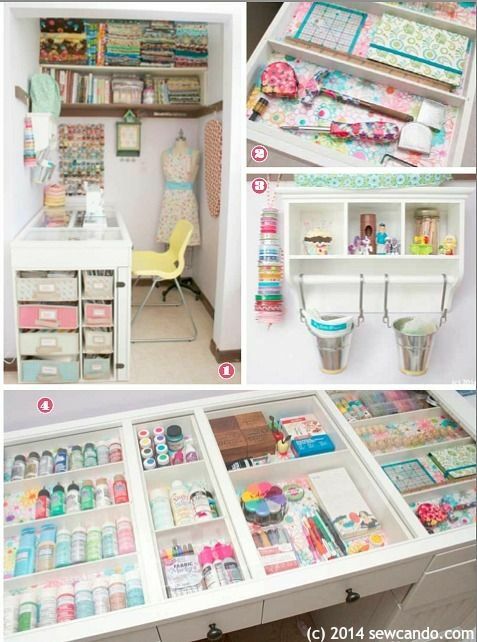 I have never seen those sewing desks; they look extremely helpful and organized. I'll look into them more. Thanks so much and you are so right about the desks. They are fantastic - they truly have made a big difference to how much I can cram into my small room and in keeping things organized. They aren't cheap, but well worth saving up for! Congratulations! !!!!! ♡♡♡♡ YOU DESERVE IT !!!!! LOVE your blog !!!! Your new crafting room is terrific! It will inspire many who view your feature article in the Room to Create magazine. Congratulations on a job well done!!!! That's so cool! Congratulations, that room is absolutely gorgeous! Thanks very much - I'm thrilled so many people like it! Wow! What an honor for you! Every time I had a peek at your craft room, I thought how beautiful and well organised it is. So it just seems right that you are featured in this magazine. I also wish to thank you for hosting your link party week after week, giving us the opportunity to showcase our creations and to look at other's. Have a great week! Awesome! Congrats for being published. I can see why. Great use of space! Thanks Joy - the limitations I had really helped me to get creative with it! They really show the difference some time and effort can make!